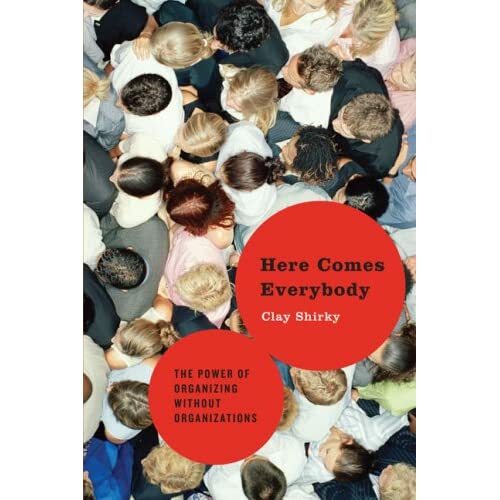 Tonight I went to a Berkman-sponsored talk by Clay Shirky at Harvard Law School o discuss his new book, Here Comes Everybody: The Power of Organizing Without Organizations. Clay Shirky is a professor of new media at New York University, where his classes discuss peer-to-peer technology and how online social networks effect culture. Why did groups form more slowly in the past? Because when you add more people to a group, there are disproportionately more connections (a group of 5 has 10 connections, a group of 15 has 105.) For this reason groups broke down. Now, maintaining these links is easier to produce. This is known as “ridiculously easy group formation,” a key attribute of the Internet. The “reply all” function of e-mail was the first truly social function of the Internet. Having a group conversation became as easy as clicking a button. This hasn’t been revolutionary in all spheres. Shirky claims that interesting social effects only occur when a technology is deeply rooted in the culture. It is ubiquitous and even boring. All college students and all white collar workers are now online. This is when things get interesting. In a service like the social bookmarking site del.icio.us, sharing is primarily driven by selfish motives and collaborative structure forms above it. Action is not coordinated in advance, but coordination can happen subsequently as people identify themselves while taking part in sharing of previously-produced content. For example, when an image made using a new photography technique appeared on the photo-sharing site Flickr, the comments stream soon became a master class in how to reproduce the technique. At the next level of complexity is collaboration, which requires team work. One group of anime fans got together to subtitle the best Japanese anime so it could be brought over to the US. There was no market motivation. When the anime owners created their own subtitles, they tool down there own subtitled versions down. The group members simply loved anime and wanted the best of it to be more widely distributed, so they worked together to identify, subtitle, and post their favorite shows. Collective action is the rarest and most complex form of cooperation. After a flight was left on the runway for 8 hours in 2007, airline passengers got together and forced New York State to pass a Fliers’ Bill of Rights. One passenger, Relo Hanni, started posting comments on news stories about the incident asking other passengers on the flight to contact her. Soon they began a nationwide campaign for a Fliers’ Bill of Rights. Thousands of people signed an online petition. People called their political representatives. The bill failed in Congress, but it succeeded in the New York legislature. Shirky also gives examples of Belarussian LiveJournal users organizing a flash mob of ice cream eaters that were arrested by the police for demonstrating in the central square of Minsk. Photos of the ice cream eaters being arrested were then posted online, drawing attention to repression in Belarus. Shirky sees collective action increasing in the future. From the standpoint of the Internet and Democracy Project, we certainly hope it does. An Overlooked Dimension of Internet and Democracy? When we compare cases where the Internet has played a significant role in democratic struggles (such as the Orange Revolution in Ukraine) and the case of Burma where the use of Internet for internal political mobilization is severely limited, we may be inclined to conclude that the Internet in Burma has largely been unsuccessful to bring about significant change towards democracy. While this observation may largely be correct, this conclusion has the danger of overlooking one fundamental aspect of the fight towards democracy – one of holding governments accountable, no matter what kind of a government it is, democratic or autocratic. If we compare the crackdown of the Burmese military government on general citizens in 1988 with that of 2007, we see that both have been aimed towards quenching a nation-wide protest that was going out of control. However, one major difference that we see between 1988 and 2007 is the the extent of brutality in resisting the protesters and the number of deaths – in 1988, no less than 3,000 people were killed in a few days but in 2007, the official number of death is 13 while the UN Human Rights Council claims the number to be around 100. Largely due to the Internet, the entire world could see what was going on inside Burma from their own living room TVs. The national protest quickly took the form of a global protest – this was a new reality that the repressive military government woke up to. It was a reality that needed cautious strategies – it needed walking a thin line between effective handling of the protest and maintaining an image of fairness to the outside world. The upshot of this is that the Internet in Burma played a significant role in keeping the Burmese government accountable for its actions, or rather its inactions. While this is not as glorious an impact as a regime change, it is still an important step towards democracy that should not be overlooked. The Dutch innovation organization Springwise reports that Korean citizen journalism site OhmyNews is opening a school for citizen journalists. 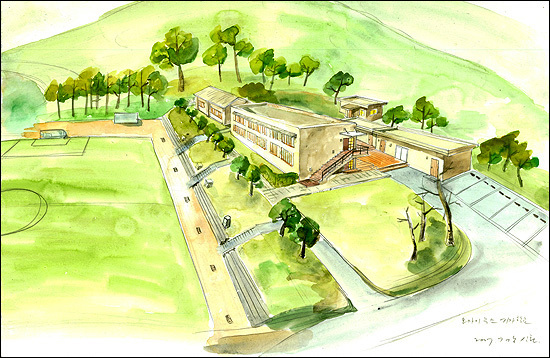 The program will take place in a renovated elementary school located 90 minutes from Seoul. The school is deliberately designed as a retreat, to “give urbanites a rare opportunity to recharge themselves as content creators in the middle of idyllic rural setting”. The purpose of the program is to disseminate the skills of journalism more widely among Koreans, a in keeping with OhmyNews’ founder Oh Yeon Ho’s mantra that “every citizen is a reporter.” While some classes are aimed at Korean citizens, others will teach NGO members and businesspeople in the skills of citizen journalism. Professional journalists aren’t immune to further instruction, and some classes will aim specifically at “re-educating” them in the practices of more tech-savvy and inclusive journalism model that OhmyNews embraces. An article on the OhmyNews web site also notes that “various classes on general health care and other well-being issues will also be on offer.” While serious in content, OhmyNews does seem to be promoting the school as a money-making venture, a place for urban Koreans to “recharge” while learning citizen journalism and for corporate manager to hone their skills. Whether the focus of the school is teaching or leisure will likely affect perceptions of OhmyNews. Will opening this school/retreat further their mission or dilute the politically radical mission of the 727 news guerrillas by catering to the rat-race weary bourgeoisie? You can read more about OhmyNews in “The Citizen Journalism Web Site ‘OhmyNews’ and the 2002 South Korean Presidential Election,” a case study I wrote for the Internet and Democracy Project. Berkman Center Fellow Ethan Zuckerman provides a great big picture view of the trends in digital activism in developing countries, and reminds us that so many of the pioneers in this field are aware of the disconnect between the emerging middle class and most Kenyans. This group of bloggers and their peers are documenting the election crisis in a way that’s unprecedented in Africa. Traditionally, we’ve heard about African crises either long after they took place (Rwanda) or through the eyes of international media (Darfur, northern Uganda, eastern DRC). In Kenya, we’re hearing raw, emotional accounts from people directly affected by this violence. These accounts are complicating mainstream media narratives. Immediately after the election, many newspapers offered a narrative of the Kenyan violence in terms of “long-simmering ethnic tensions” – bloggers reminded us that these tensions had been consciously stoked by political parties, and that the nation had been largely free of serious ethnic tension for most of its history. As the violence has taken on a clear ethnic cast, bloggers have reminded us how unexpected and how shocking the violence is against the backdrop of Kenyan history. When discussing the role of technology in Kenya’s recent post election troubles, a big part of the story here and elsewhere has been the use of mobile phones both as a one-to-many communication tool (Twitter, ect…) and as a way to exchange resources in times of need (Mama Mike’s and mPesa). On January 3rd, a few days after the election, Juliana from Afromusing first reported from Eldoret that the government sent its own message threatening those who use SMS to mobilize public action. At first I was concerned that Kenya was going the way of Ethiopia, who completely shut down the SMS system during the election process in June 2005. However, its important to point out the context in which these messages were sent. Human rights activists added that part of the problem was that otherwise upright citizens contributed to this hate speech because of the ease and excitement of forwarding these messages. The story also interviews Safaricom CEO Michael Joseph who said that the government indeed did consider shutting down the SMS system, but mobile phone providers convinced them to pass up this idea, and instead allow the providers to send out messages of peace and calm, which Safaricom did to all nine million of its customers. We rightly spend a lot of time talking excitedly about how digital/networked technology can be useful for democracy and human rights advocates in Africa (see our wonderful recent conversation in Istanbul). However, like the Mabira forest protests in Uganda, this story is another sobering anecdote that reminds us that these technologies can also be used for violent public action. As is often the take-away from our investigations, the message seems to be, technology is neutral. cross-posted to In An African Minute. Is e-Rulemaking an Effective Path Towards Increased Civic Participation? Government regulations have a deep impact on the lives of citizens – so, it is only fair that citizens have adequate say in the process of formulation and revision of these rules and regulations. It was this premise that prompted the promulgation of the e-Government Act in 2002 that directs government agencies to use information technologies to enhance citizen participation in government rule-making. A hallmark project of the US government towards this end has been the launching of the portal www.egulations.gov. Several US government agencies such as the Department of Agriculture, the Department of Transportation and the Nuclear Regulatory Commission have made efforts in bringing in the voices of the public with varying degrees of success. Tens of thousands of people have participated in various rule-making processes online and with the advent of Web 2.0 and various interactive web features, the process of participation in electronic dialogues has been enhanced. The ‘cyber-optimists’ feel that this has opened up scope for broader level of public participation, while others are less enthusiastic about the potential of this form of electronic dialogues to translate into meaningful participation given the level of complexity in the rulemaking process. According to experts such as Cary Coglianese and Thomas Beierle, the primary challenges at this stage of the evolution of e-Rulemaking seem more administrative rather than technical. To ensure meaningful feedback and interaction among citizens, there seems to be a clear need for an active moderator encouraging participants to keep their discussions focused and relevant. The government agencies also need to develop a more sophisticated process of processing and summarizing citizen’s feedback and to more seamlessly integrate them with the rule-making process. There is also dissatisfaction regarding existing systems to alert the public about the e-Rulemaking platforms in a way that ensures that people in different socio-economic classes are participating in this electronic process – without which the legitimacy of this process in enhancing democracy will remain questioned. Although it is too early to conclude that e-Rulemaking has made substantial progress towards strengthening democracy by enhancing citizen participation in government policy-making, there is perhaps no doubt that e-Rulemaking has significant potential in empowering citizens and ensuring better policies. How we are able to use that potential is what remains to be seen. Posted in Uncategorized. Comments Off on Is e-Rulemaking an Effective Path Towards Increased Civic Participation? Who’s Afraid of the Big, Bad Facebook? Although Facebook is probably known more as a threat to productivity stateside, Sacred Facts’s post surveying its censorship in a number of Middle Eastern countries hints that social networking sites may pose a unique and potent threat of democratization to repressive regimes. And given the presence of similar censorship extending to other social networks, it seems at least that the authorities of the censoring nations seem to agree. Of course a number of the decisions to censor social networks, as well as to censor Web 2.0 technology more broadly, have been justified solely by the desire to keep out sexually explicit content. But that explanation, perhaps partially true in some instances, does not provide a complete account across the spectrum of censoring states, some of which have been open about targeting political speech. Nor does “protecting social norms” seem to be a default explanation for users targeted by this censorship. When Syria recently decided to block access to Facebook without official explanation, reactions to the decision were varied. Admittedly the prospect that state censors will provide transparent accounts of their conduct or motivation is whimsical. Their goals may span that entire spectrum or may track more closely with a subset of them, and there is minimal incentive to be open. Highlighting acts and possible motivations of censorship help highlight possible paths to support democratization. Posted in Current Events, I&D Project, Tech Tools. Comments Off on Who’s Afraid of the Big, Bad Facebook?